West Watooka Farmers Tarmac- Another White Elephant? A farmers’ tarmac which was commissioned more than three years ago at West Watooka to facilitate the selling of produce is yet to be used for the purpose for which it was intended, and is seen by Lindeners as “a white elephant”. 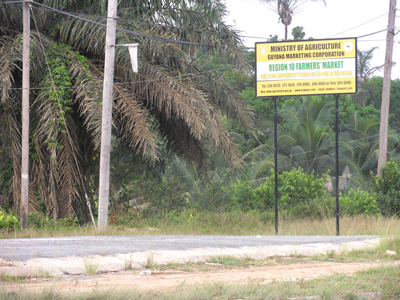 The $3M tarmac, which was commissioned by then Minister of Agriculture Robert Persaud, was intended to boost the sale of farm produce, and as was noted by the Minister and others, at its commissioning, is strategically located. Persaud had noted that the tarmac is easily accessible, not only for Lindeners but for people who pass through the town on their way to the interior. Persaud had also posited that the facility was strictly for vending of farm produce. “This is for the farmers; this is for fresh agricultural produce only. This is an investment for the farmers only and we expect that it is used for that purpose only,” he had emphasized. However, to date no agricultural vending, or any sort of economic activity, has taken place at the facility, apart from the vending that was done on the date of its commissioning. Frustrated farmers from West Watooka when asked why they were not utilizing the facility, bluntly related that ‘a concrete strip alone’ is far from adequate to facilitate vending. “We need a shed- our produce would shrivel up in no time in the hot sun,” one farmer pointed out. That sentiment was reiterated by several others, many of whom saw the investment as a waste of taxpayers’ money. Lindeners are also of the view that the money invested in building the tarmac, could have been better used to upgrade the Wismar or Mackenzie Markets. West Watooka is one of the largest farming communities in Linden, with scores of farmers. But farmers have long been venting their frustrations on several issues that affect them, including the areas’ susceptibility to flooding.